For the eleventh year in a row, WHRO hosted The Virginian-Pilot Spelling Bee live in our studio! For the past 11 years, the Virginian-Pilot and WHRO have co-hosted The Virginian-Pilot Spelling Bee, a regional spelling bee made of middle school students in the Hampton Roads area. Each student whom won his or her school spelling bee gets a chance to partipate. 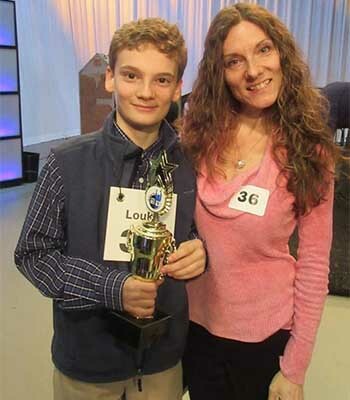 Every year, the winner of the Virginian-Pilot Spelling Bee gets a trophy and an expenses paid trip to compete at the Scripps National Spelling Bee in Washington, D.C. He or she also receives an Ipad mini. This year was different. Due to a blizzard in early January, many middle schools cancelled their spelling bees and never rescheduled them. That meant only 58 out of the expected 70-something middle schoolers qualified to compete in the regional spelling bee. WHRO's own Classical Music host, Raymond Jones, was the annoucer for this year's spelling bee. He, along with three other judges, an editor from the Pilot, an editor from a local newspaper, and a journalist, monitored the event. After a dress rehearsal, a quick lunch, and a couple pep talks, the students were seated in number order, in the black chairs that lined the studio. They asked questions--whether or not punctuation marks, capital letters, or hyphenated words would be included. They were told simply to state their name, their school, spell the word, and wait for an answer: correct or incorrect. In a separate room, the parents took their seats, quietly stared at a large mounted television that showed their children, and waited. At 2 p.m. sharp on Saturday, Feburary 17, the competition began and WHRO broadcast the event live on television, WHRO's website, WHRO's Education Facebook page, and lastly, a 360-degree video via Youtube. The 360-degree camera was a new addition this year, giving viewers a behind-the-scenes look at the competition. The entire broadcast lasted almost three hours. Round after round the words got harder and harder. The words ranged from "chocolate" and "enchilada" to "piazza". Kids spelled out and left the stage. Some left quietly, some mumbled under their breath, and others cried. They rejoined their parents in another room. About an hour and half into the live broadcast, only five out of the 29 particpants remained. 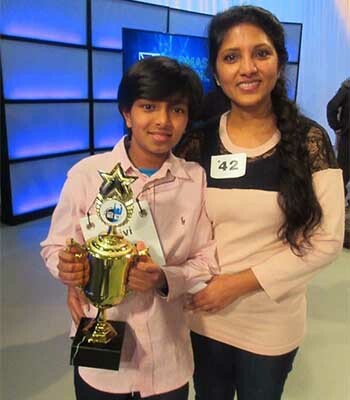 Srivi Hathwar (pictured below center), a student at Norfolk Academy, almost won first place, but lost on the championship word, "xiphophyllous", which meant that all five remaining contestants would have one more shot for the title. In a tense back-and-forth battle between Loukas Fetter (pictured below right), a student at Greenbrier Christian Academy, and Michael Volkov (pictured below left) of Princess Anne Middle School, Volkov finally won. He then spelled the championship word, "loculus", and claimed victory. Hathwar and Fetter claimed second and third place. In an interview with WHRO, Volkov noted that having confidence was important in helping him win. 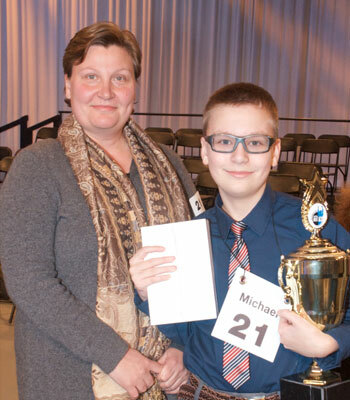 A third-year participant in the spelling bee, his hard work paid off. He told WHRO that he studied the words sent to all the contestants in an email and that he "came here to win"--and he succeeded. See the recorded broadcast of the 2018 Virginia-Pilot Spelling Bee here. To watch past Bees, click here.